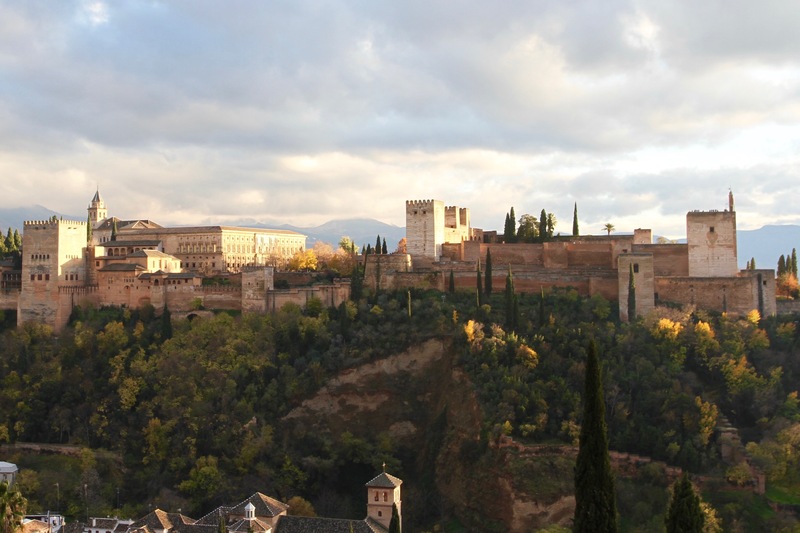 Perched on a plateau and dramatically framed by the Sierra Nevada mountains behind, the Alhambra sits serenely overlooking the city of Granada. 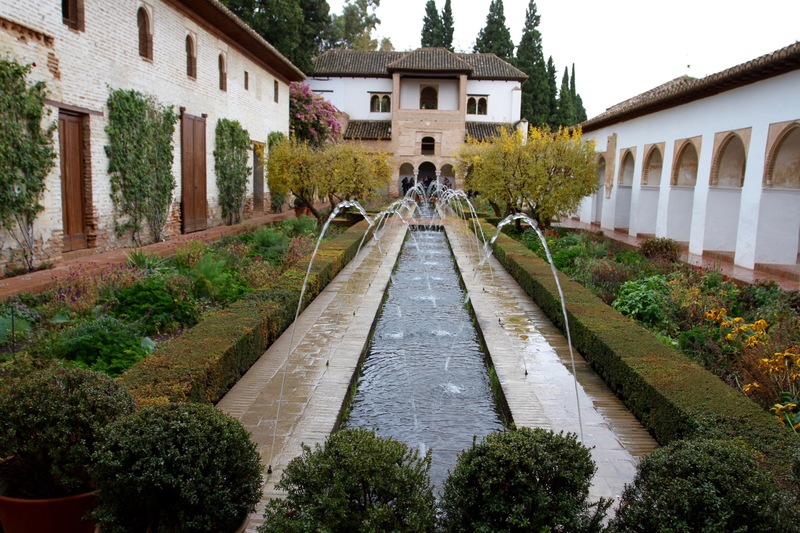 Walking the maze-like alleys of the ancient Muslim quarter of the Albaicín, you get tantalising glimpses of the Alhambra between buildings. 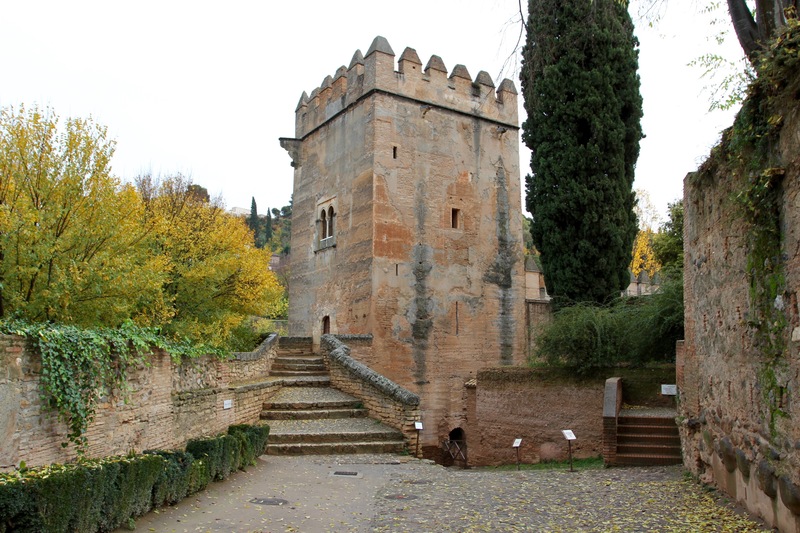 Climb the hill to the Mirador San Nicolas though, and the full glory of the Alhambra reveals itself. There are several Alhambra miradors, but the little square in front of the Church of St. Nicholas (better still, climb the church tower) offers uninterrupted views. It’s a lively gathering place for people, and often has amateur music and flamenco performances. The view is beautiful at any time of day, but the reddish walls glow in late afternoon sun. We took the view on our first day in the city, the next day we had tickets to visit. Everyone knows that in Spain it mainly rains on the plain. Except, of course, when it doesn’t. 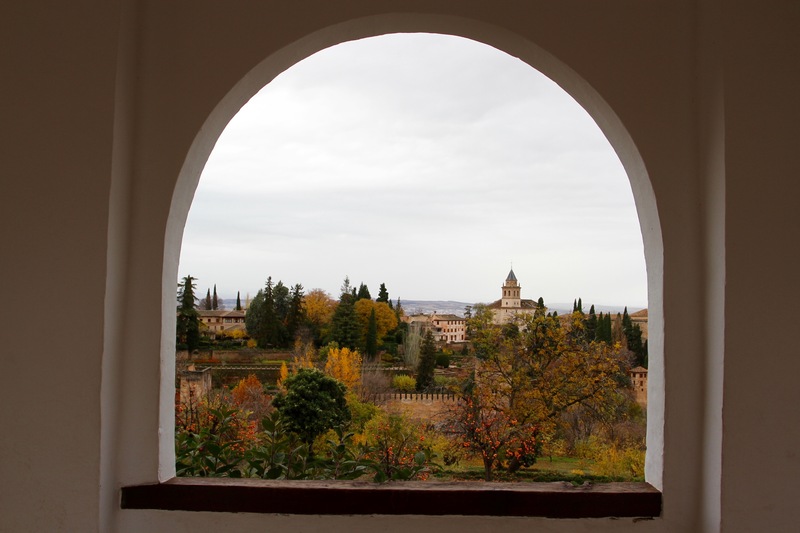 I don’t know how often it rains in Granada (not often I’m guessing), but we woke the next day to a grey, dreary and cold day of drizzle and downpours. Not ideal for wandering around the Alhambra, much of which is outdoors. It was disappointing to visit in bad weather, but we were determined the rain wouldn’t dampen our spirits. 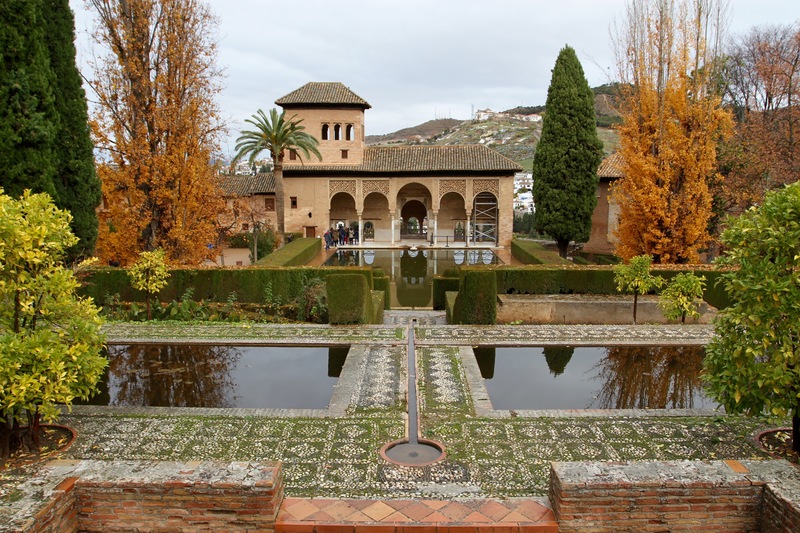 The Alhambra started life as a fortress, the Alcazaba, in the late 9th century, 180 years after the Umayyad Caliphate had established itself in Spain. 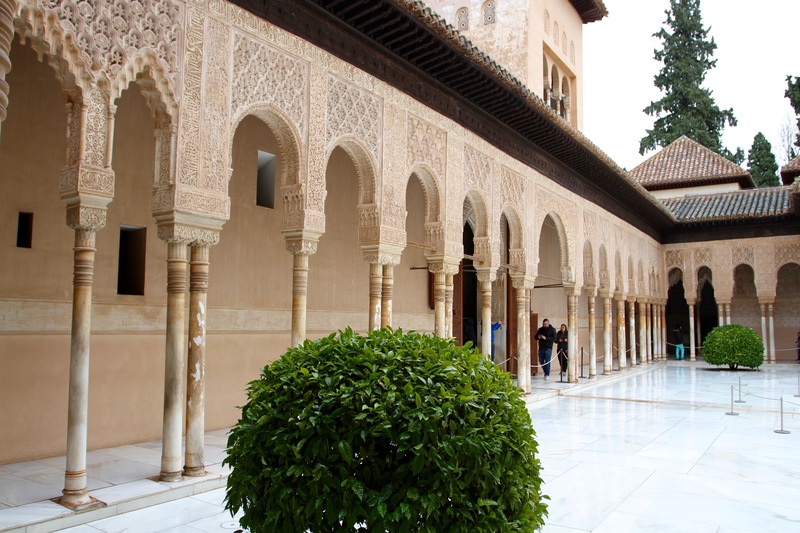 Cordoba and Seville were the centres of power, Granada little more than a backwater. 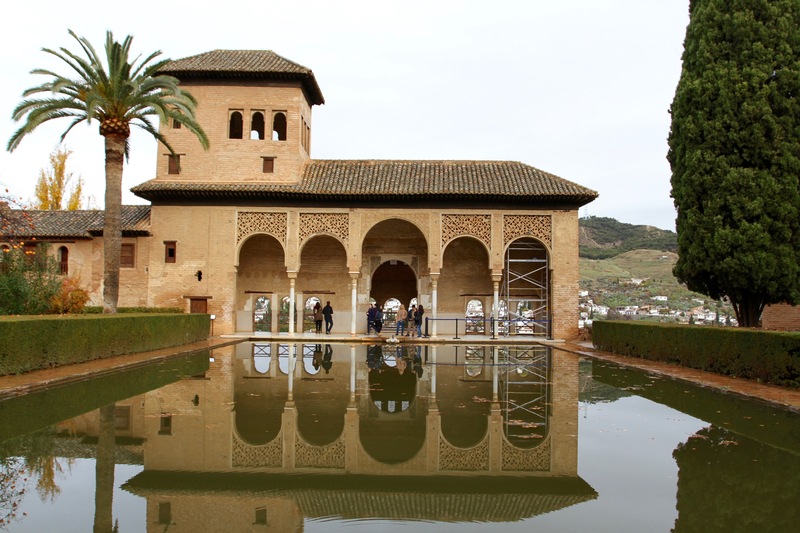 It wasn’t until 1238 that work began on the royal palaces. By then, the Caliphate was already in retreat, having lost over half the territory it controlled at its peak to Christian kingdoms in the north. 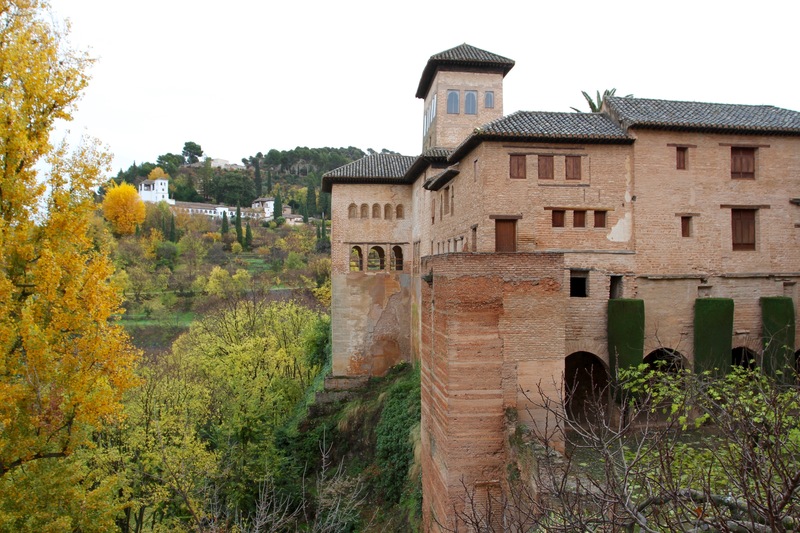 Over the next century the Alhambra grew to be the majestic complex of today. 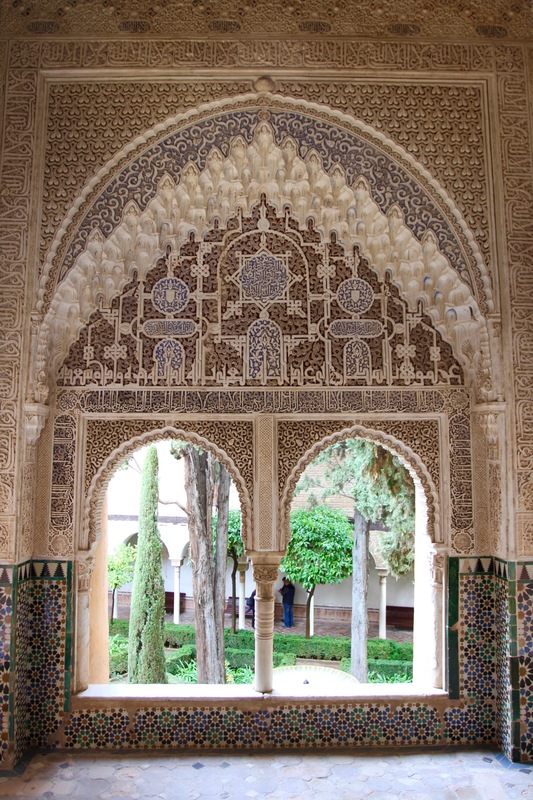 The Palacios Nazaries, considered by many to be the finest example of Islamic architecture in Europe, was constructed in this period. 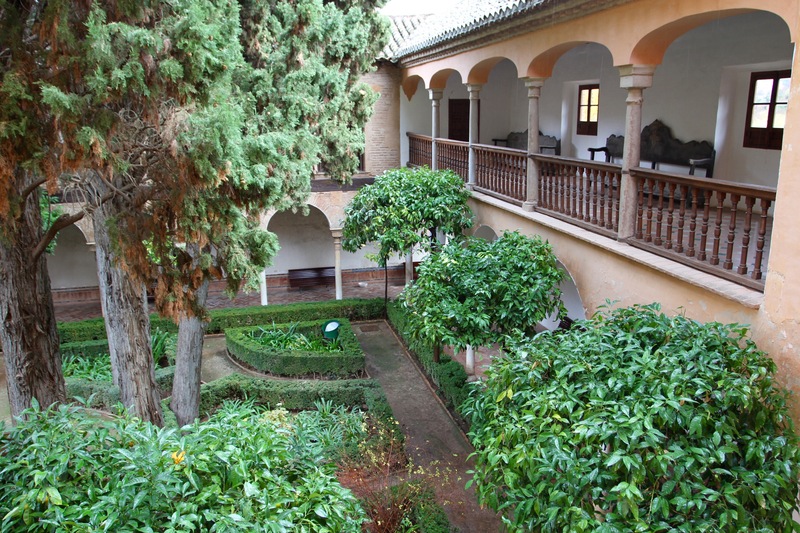 The mix of exquisite rooms, courtyards with fountains, beautiful carved roofs and tiles with mesmerising geometric patterns and Arabic inscriptions, make it hard to argue with that assessment. 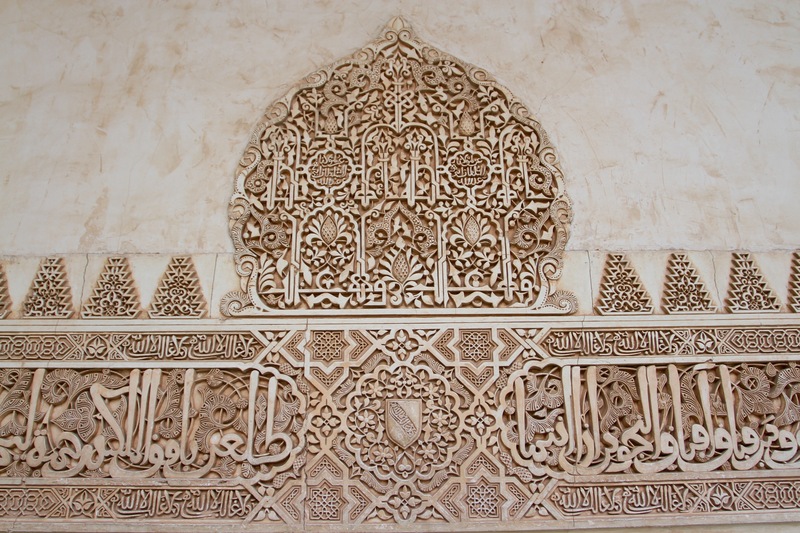 This is the real highlight of a visit to the Alhambra. Even with tour groups sweeping through and selfie stick-wielding tourists, it’s hard not to feel a bit overwhelmed by the magnificence of it all. 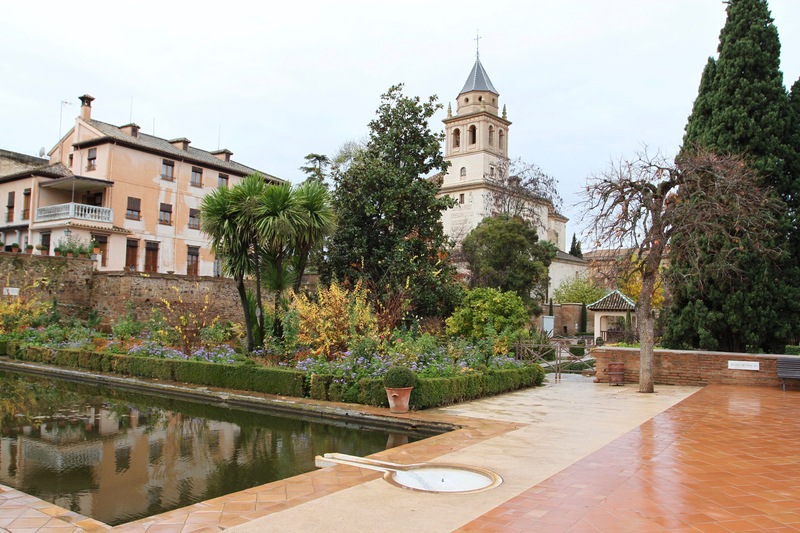 We spent so long in the Palacios Nazaries that when we emerged into the Gardens of the Partal Palace it had stopped raining. 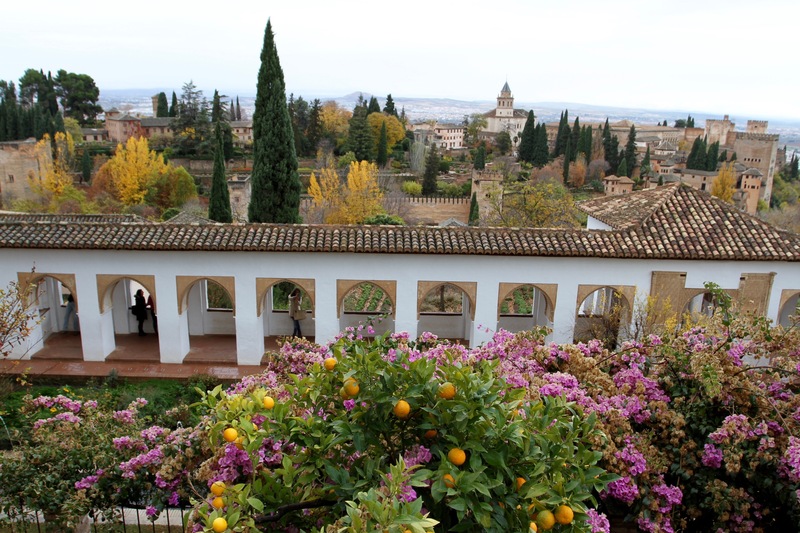 We wandered the gardens on our way to the Generalife, taking in the fantastic views over Granada. The whole place exudes a sense of balance and harmony. 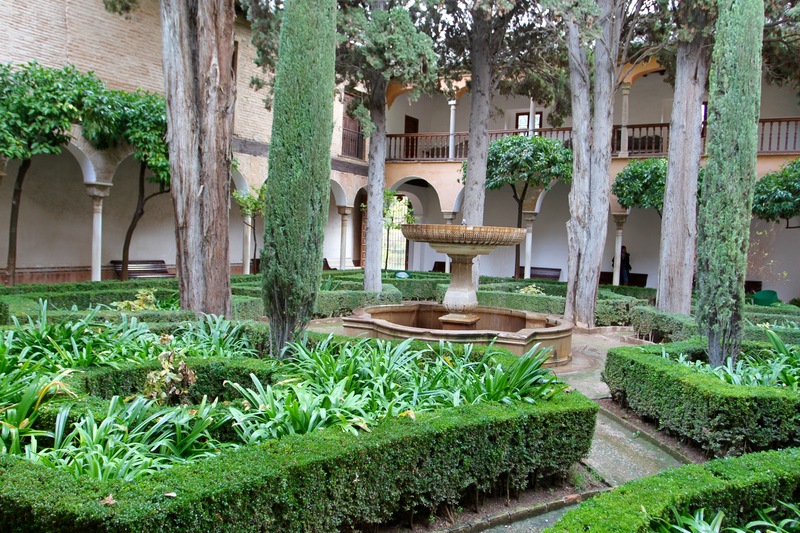 The original buildings and gardens compare well to the disastrous later additions made by King Charles I (better known as Holy Roman Emperor, Charles V). 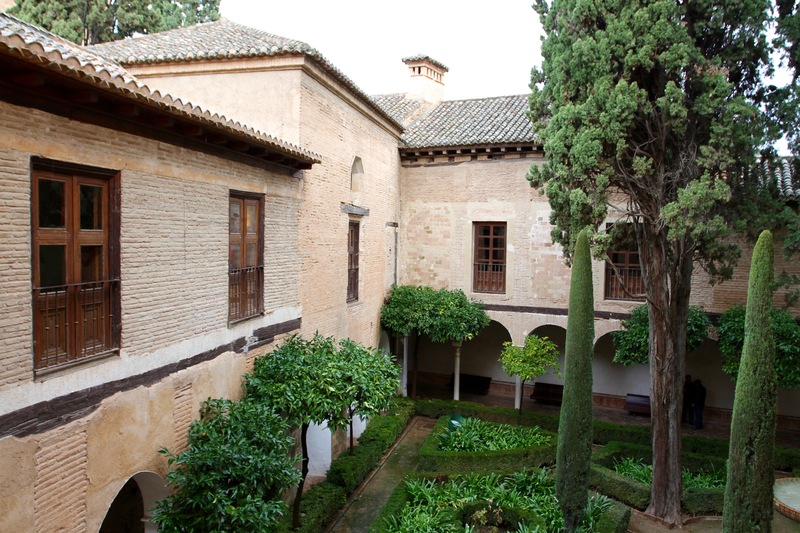 His Renaissance-style Palacio de Carlos V is like a wanton act of vandalism, a huge unsophisticated lump imposed upon the more refined and delicate vision of earlier rulers. Walking through the Alhambra today, it’s incredible to think this glorious complex of fortress, palace and pleasure gardens, was abandoned in the 18th century and largely forgotten until the early 19th century. 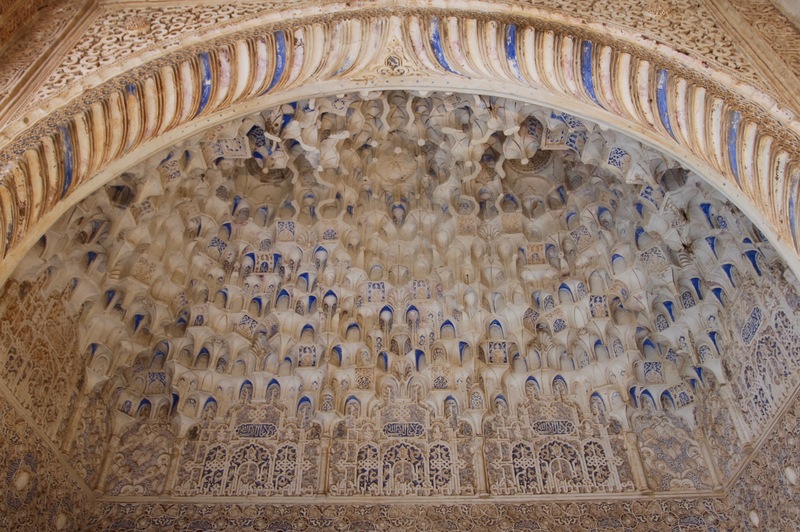 Interest in the Alhambra surged after celebrity American author, Washington Irving, published his Tales of the Alhambra in 1832, kick-starting the slow process of protecting and restoring the entire site. 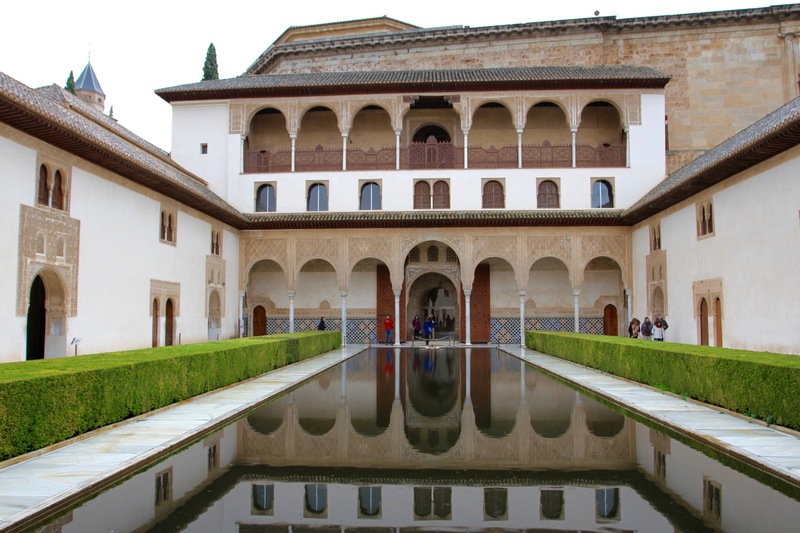 The Alhambra’s obscurity ensured that it survived largely intact, and what you see on a visit today is the 13th or 14th century original. If anything, today it’s become a victim of its own success. More than two million people visit each year, and that must take a huge toll on the fabric of the buildings. Even on a rainy day in winter there were crowds of people, and plenty of disregard for signs asking people not to touch. That can’t be sustainable in the long term. Lalibela’s 900-year old rock-hewn churches have been built in two distinct groupings, one group in the north and the other in the east. You can visit both in a single day, but it is probably better to give yourself more time to fully absorb the wonder of this place. The churches are connected by a series of ancient passageways and alleys, which are atmospheric places to wander. The history of Lalibela is palpable. Everywhere you look there are stone corridors and staircases rubbed smooth by the passage of pilgrims over centuries of devoted worship. 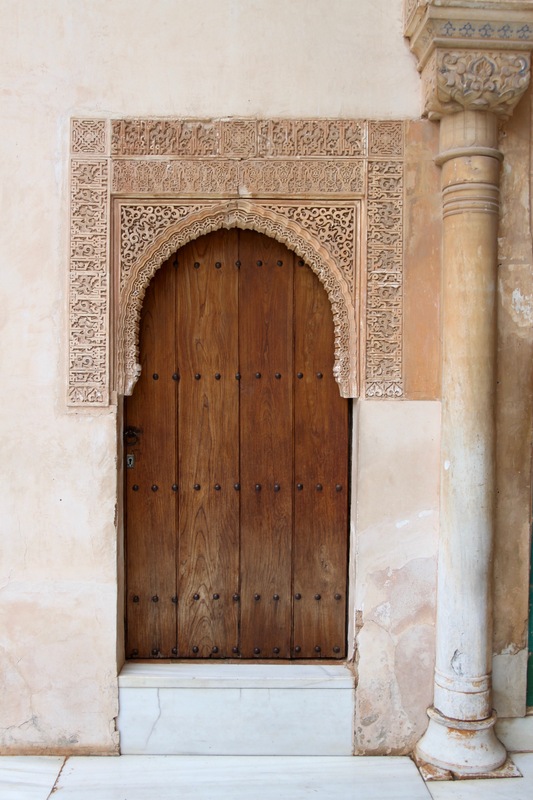 Buildings are carved with simple, early Christian symbols, and turning a corner can bring you face-to-face with a group of worshippers, in a scene which could have been witnessed at any time over the last 900 years. A visit to the churches is both full of surprise and a little disorienting. 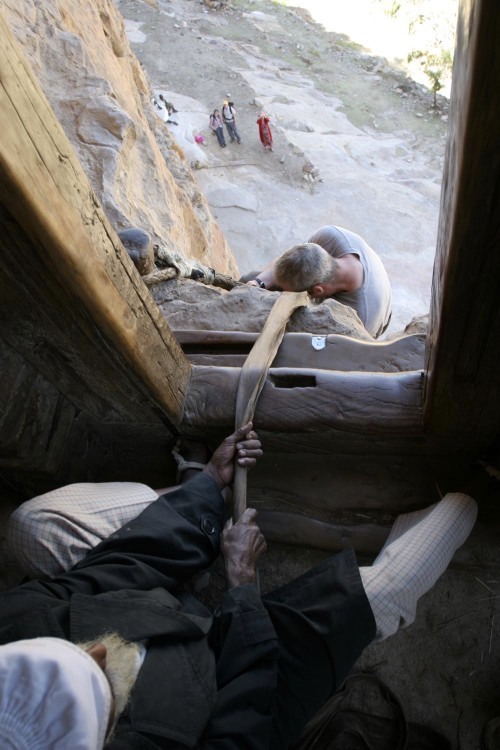 In true Indian Jones style, the churches of Bete Medhane Alem and Beta Maryam are linked by a tunnel, carved several feet underground out of solid rock. You can’t but admire the enormous effort which has gone into building this New Jerusalem. Set amidst beautiful rolling countryside, this mountainous region provides the perfect backdrop to such an ancient and mysterious town. Yet, despite all the history, Lalibela remains a small and relaxed place largely off the beaten track. Tourism has made an impact here, but remains low key and largely unobtrusive…for how long remains to be seen. Laliebla is a place like no other in Africa. It is home to some of the most awe inspiring buildings on the continent: 900-year old churches carved from solid rock, set amidst glorious mountainous scenery. It is a place where myth and reality merge together almost completely. Historical fact is, at times, impossible to extract from a maze of legends and half remembered truths. In a place as truly extraordinary as this, you can forgive the exaggeration and myth-spinning, because the sight of Lalibela’s rock-hewn churches is enough to disorient the senses. Local legend states that King Lalibela, in a coma after being poisoned by his brother, was instructed by God to build the New Jerusalem in Ethiopia. So much for WIlliam Blake’s claim that the New Jerusalem would be built in England’s ‘green and pleasant land’. The Ethiopians got there centuries before Blake penned his poem, and there isn’t a ‘dark satanic mill’ anywhere to be seen. Good to his word, King Lalibela constructed a town of churches like no other, including naming things after their counterparts in the actual Jerusalem. To achieve this monumental feat of engineering and construction, King Lalibela is supposed to have enlisted the help of a legion of angels who, apparently overnight, built the churches. I asked our guide whether people believed this to be the literal truth, and was met with the icy response that in Lalibela people believed this story absolutely. Modern researchers believe that the churches were constructed in the 12th or 13th Centuries, which does at least coincide with King Lalibela’s reign. Dismissing the angels altogether, this research estimates that a workforce of some 40,000 people would have been needed to build the churches. A project not unlike those of the much more famous Egyptian rulers to the north, and as equally monumental. In truth, it isn’t really accurate to describe the churches as being built. They are carved out of solid rock into functional buildings; they are literally monolithic. It is an amazing place that will test your perceptions in more ways than you might imagine. Just one look at the church of St.George, carved literally down through the rock, will boggle the mind with the ingenuity and technical skill of the Medieval civilisation which constructed it. Lalibela is, first and foremost, a spiritual town and a centre for one of the oldest forms of Christianity on the planet. People come here on pilgrimage from all over Ethiopia (joined by a fair few international pilgrims these days, many from the large Ethiopian diaspora), often walking for days to reach the town which sits in the mountains of northern Ethiopia. Our timing wasn’t great, dictated as it was by flight schedules. It would have been nice to have been in Lalibela on a Sunday, to witness the hundreds of worshipers who arrive throughout Saturday night to attend services. Otherwise the town is quite quiet. Although during festivals – such as Easter – tens of thousands of pilgrims descend on the town, creating one of the most extraordinary sights in Ethiopia. White robed pilgrims celebrate throughout the night, their candles illuminating the darkness around the churches. Regardless of when you visit Lalibela, it is likely that the impression the town makes on you will be lasting. We hired a guide to take us around the churches and explain their ‘history’. He was a young man who seemed to know everyone in the town, and who guided tourists to support his mother and siblings after his father abandoned the family – an altogether too common occurrence in Ethiopia. We visited all eleven of Lalibela’s rock-hewn churches, walking through narrow alleys, meeting the priests in each church and navigating between churches through passageways and tunnels carved out of solid rock. It was a magical and mystical experience. The only thing which jars a little, and this is a small issue, is the large metal roofs that have been erected over some of the churches by UNESCO to protect them from water damage. They’re quite ugly, but rather that than churches which are badly damaged. The ability to block out the unpalatable, however inevitable, is one of the more remarkable things about human psychology. 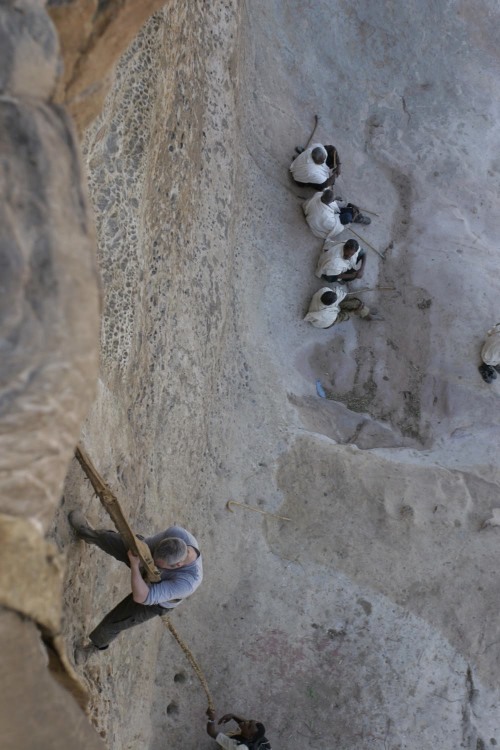 So it was, after climbing up the rock face to get into Debre Damo Monastery. While I explored the hilltop and took in the views over the surrounding countryside, I put the descent out of my mind. It was only when I got back to the entrance/exit point that the inevitable dawned on me. The view down the sheer rock face was disconcerting at best. Like a child who has climbed a tree, only to find themselves regretting it when its time to come back down, I felt like calling the fire brigade. Unfortunately, there was only one way off this particular rock…time to descend. All but the last photo in this selection were taken by Boris Kester from the Netherlands, a fellow traveller who I met at Debre Damo. For the living, the Debre Damo Monastery is an all male affair. To gain access as a woman, you have to be dead – please don’t shoot the messenger, I don’t make the rules. It just so happened that when I was visiting Debre Damo, I was able to witness the funeral of a woman from one of the local villages. Her first visit to the monastery would, alas, be her last. There is only one way onto the mountain where the monastery is located, which meant that the coffin had to be hoisted up the vertical rock face before being taken onwards to the funeral service. It was a remarkable sight to see the funeral arrive at the base of the mountain. Accompanied by dozens of mourners and musicians, as well as people carrying ceremonial umbrellas and Ethiopian flags, it seemed more like a celebration than a funeral. After wondering around the mountain top, I was heading back to leave when a sudden riot of colour in the distance caught my attention. Priests were gathered around under a tree, dressed in wonderfully bright colours and carrying even more extravagantly colourful umbrellas. A band played traditional music and the head priest said prayers. There were plenty of people attending proceedings, but they were all men. I felt rather sad that this woman’s female friends were barred from being there as well. 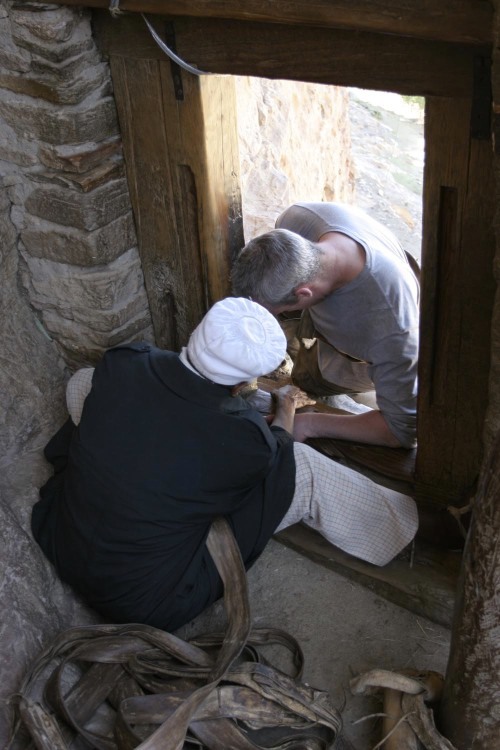 They don’t make it easy to get into Debre Damo Monastery. Getting to it involves a lovely drive through some beautiful countryside, its only once you’re there that the problems start. If you’re male, there is a climb up a 40 meter-high sheer rock face, followed by squeezing yourself through a narrow doorway before you finally can say you’ve truly arrived. If you’re female, and there is no easy way to say this, you need to be dead before you can enter the sacred confines of the male only monastery. It’s not only human females that are banned from the monastery, there has been a ban on females of any species for the last 1400 years. If I’m being honest, as I was suspended from a rope half way up the rock face, I found myself wishing that they didn’t let males of any species into the place either. I can’t quite describe the ordeal involved climbing up the rock face. 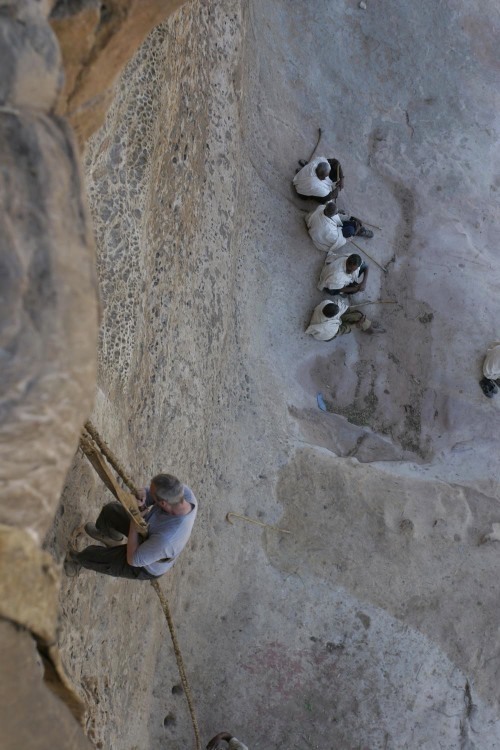 I’d watched several Ethiopians zooming up without much effort, just using the rope that came down from the entrance. For a tourist like me, the monastery officials tied a rope around my waist and a man, possibly the strongest 80 year old in the world, helped to pull me up. There’s nothing like a ‘senior citizen’ doing the majority of the work for you to improve self esteem. It’s an exercise in humility. Thankfully, it was worth all the effort and humiliation. Debre Damo Monastery is a place that needs to be seen to be believed. The monastery’s location, sitting at 2216 meters above sea level on top of a flat-topped mountain with sheer-sided cliffs, sets a dramatic scene and, once you’ve reached the top of the cliffs, the views are spectacular. The history of the monastery is fascinating. It is dedicated to Saint Abba Aregawi, one of nine Syrian Christians who came to spread Christianity in Ethiopia in the 6th Century. While Aregawi settled on Debre Damo, the other “Nine Saints” all settled in this region and have similar churches dedicated to them. Legend has it that Saint Aregawi flew to the top of the mountain on a winged serpent under the direction of St. Michael, thus avoiding the need to be hauled up there by an octogenarian. The building itself – which I couldn’t enter because there was a funeral taking place – incorporates stones and other elements from the pre-Christian Axumite Empire into the church’s structure. I was allowed to climb the bell tower of the church, which provided great views over the village and surrounding countryside. The flight from Addis Ababa to Axum, or Aksum as its also called, provides a tantalising glimpse of the mountainous highlands which comprise much of northern Ethiopia. We’d have preferred to travel overland, but Ethiopia is a big country with an underdeveloped transport infrastructure. Travel times by road vary from lengthy to inhumane; with only twelve days, Ethiopian Airlines’ internal flights were the only solution. Axum was the centre of imperial power for the mighty Aksumite Empire. The empire was thriving by 300 BC, by 300 AD it rivalled the empires of Rome, Persia and China in importance. Contemporary reports describe a magnificent city, socially and culturally highly advanced, flourishing on international trade. Today, none of this is particularly obvious when you first arrive in Axum. The town is decidedly underwhelming. The sense of disappointment is not dissimilar to that I felt on arrival in Timbuktu in Mali. Like Timbuktu, Axum is hot, dusty and sleepy; unlike Timbuktu, Axum is home to a wealth of sites of great historical importance. This area is also the cradle of Ethiopian Orthodox Christianity, the region is dotted with rock-hewn churches and ancient monasteries. What Axum lacks in vibrancy, it makes up for in historical grandeur, and a physical heritage unheard of elsewhere in sub-Saharan Africa. Axum’s main attraction is a large field of stelae and burial sites at the northern end of the town. The largest standing stelae is 23 meters high, and was carved in a local quarry before being transported (possibly by elephants) to the site it still occupies. This is King Ezana’s stelae, and it is carved with a doorway and several windows, thought to mirror the chambers in his tomb. Ezana was the first Aksumite king to embrace Christianity, and this monument has stood since his death in 360 AD. This was the last of Axum’s stelae to be erected. Although the stelae aren’t thought to have religious significance, the adoption of Christianity as the state religion probably caused the tradition to end. It appears that Ezana’s stelae was deliberately erected at an off-centre angle, but no one has yet come up with a convincing explanation for how it was erected. There are two larger stelae known to have been erected in Axum. The largest, at 33 meters, belonged to the 3rd Century King Remhai. It lies shattered on the ground after falling over, its 500 ton weight too much for inadequate foundations. The second largest stelae was cut into three parts and taken to Italy during the Italian occupation. It stood in the Piazza in Rome, a giant bauble hanging around Mussolini’s ego and fascism’s supposed superiority. The stelae was recently returned to Ethiopia, but wasn’t re-erected when I was there. There are numerous historic sites dotted around the town, many in the surrounding countryside. We went to the Gudit group of stelae, bizarrely stranded in the middle of a wheat field. These stelae are small, around 2 meters high, without any carving on them, reminding me of ancient stone circles in Britain. Across from the stelae are the ruins of a ‘palace’. 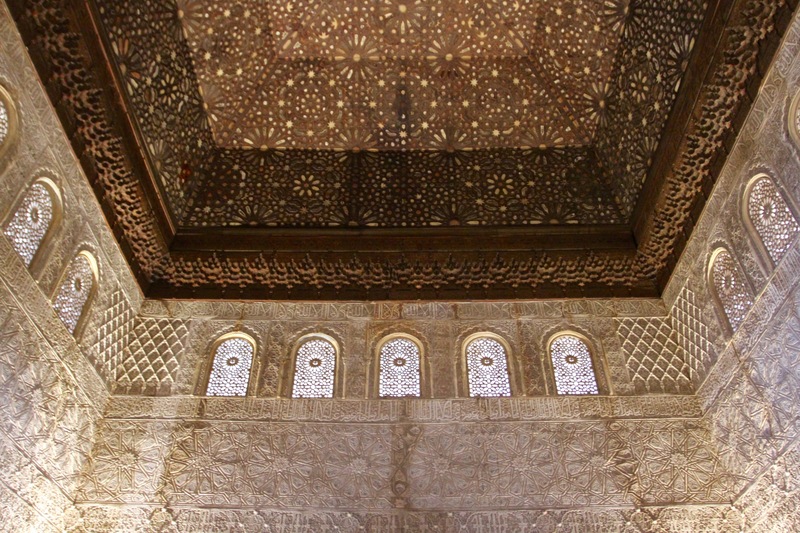 Locals tell you it belonged to the Queen of Sheba, although it was built several hundred years after her reign – no one knows who constructed it. Axum was connected by the Nile to the Nubian and Egyptian civilisations, and to the Roman Empire; as well as by trade across the Red Sea to the Middle East. It became an important trade junction between China, India, North Africa and Europe. Its all the more frustrating then, that there is so little historical certainty about it. In the absence of fact, myth has attached itself to Axum’s history, particularly the legend of the Queen of Sheba. She looms larger than life in Axum. There is similar doubt around the remains of another palace, located on top of a hill a short walk away. The Tombs of Kaleb are all that remains of this palace. The problem is, no one really knows if King Kaleb was buried here, and grave robbers have taken anything valuable which might have identified who was buried here. Descending out of the blinding Ethiopian sun into darkness, our guide lit a couple of candles and we had a spooky tour by flickering candlelight. It was all a bit Indiana Jones. As we walked back from the tombs we passed yet more stelae, just lying in a field, and we were joined by about twenty school children who, between fits of hysterical laughter, were desperate to practise their English on us. We spent a couple of days in Axum, touring the sites and getting to grips with the altitude and climate. Its a nice town, even if there is little to hold you there beyond its history. Axum is also close to the troubled border with Eritrea, and the disputed status of the border, following a UN-sponsored ceasefire between the two countries, remains a burning issue. We came across a number of UN military personnel, including some Argentinian pilots, who are stationed in the town to monitor the ceasefire. An odd place to wash up when you’re from Mendoza.